Besides the fact that cats love to lick their fur, that’s how they clean themselves. But, their grooming habits can lead to unwanted side effects, namely hairballs. Hairballs aren’t exclusively a problem for long hair cats either. Short-Haired cats suffer as well. You can help them manage their fur and keep a healthy coat while dealing with hairballs. These are our top 5 cat food options for hairballs, but first, read through our value section first to find out how you can choose the best cat food for hairballs for your cat’s specific needs. We all want what’s best for our pets and when we see our cat’s struggling to hack up a hairball we sympathize. To help your cat be sure to check these three aspects before buying any cat food! Artificial flavors and preservatives aren’t necessarily the harmful element in cat food. But, they rob your cat of real ingredients that could support skin and coat health. There is not a lot we can do for cat’s in the way of hairballs except ensure that they’re getting everything possible for their coat health and ease digestion. Artificial preservatives can negatively affect your cat’s digestion system further irritating the hairball issue. Additionally, artificial flavors and colors can damper the benefits of Omega 3 and 6 fatty acids that are known to aid in keeping a healthy coat. It’s important to note that although many pet foods don’t label artificial preservatives or flavors in their ingredients list, they do list the chemicals they use. It’s less transparency than what most people expect when they check nutrition labels, but the general rule applies that if there’s something in the ingredient’s list that you can’t pronounce, you shouldn’t purchase it. Other ingredients found in cat food made for cats that suffer from hairballs include enzymes that can break down hair. Many hairball formulas will include these enzymes assuming that your cat is having serious digestion problems because of hairballs. Vitamin E and both of the Omega fatty acids are important because they maintain the health of both the coat and skin. A healthy coat and skin is the starting point for any pet owner, cat owners especially. Often cats that suffer from hairballs will over shed from poor skin care. Sometimes cats will suffer from skin problems because of allergies, or subpar ingredients in their food. To ensure that your cat is getting only high-quality of cat food you’ll need to watch out for ingredients including “by-product” as it usually includes rejected parts that were ground together, chicken-nugget style. Pet owners are also told to keep an eye out for fish meal and chicken meal although neither of these is as bad as by-product ingredients. When you’re looking for top quality ingredients, keep an eye out for fish, turkey, and fiber-rich vegetables such as pumpkin. Another thing to consider when determining if cat food is high quality is the filler ingredients. Most dry foods will use some filler ingredients such as wheat, corn, soy, and potatoes. Given the options, potatoes and soy are preferred over wheat and corn. Grains are common cat allergies that can promote shedding and negatively affect their ability to digest anything, including hair! Blue Buffalo often does well with their recipes choosing responsibly sourced ingredients and focusing on maintaining a healthy protein to fats ratio. This Blue Buffalo Indoor Hairball Control recipe is a great option for any cat that is hacking in the corner because of their basic grooming habits. 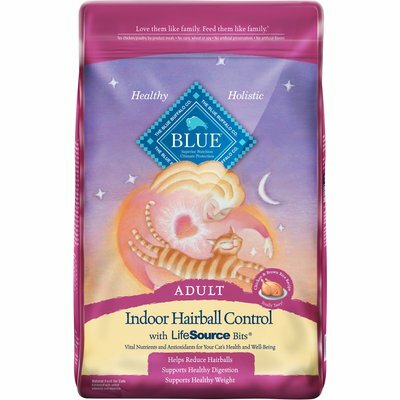 We loved that the Blue Buffalo Indoor Hairball Control recipe has the addition of Blue Buffalo’s LifeSource Bits. These Bits are loaded with vitamins and minerals as an addition to the formula. With hairball recipes, we’ll often see that they lack in some nutrients to put the Omega 3 and 6 fatty acids and fiber first. The LifeSource Bits fill in the blanks and act as a multivitamin for cats! We don’t like the ton of preservatives in this formula. Although the flavors are all natural, the preservatives have put your cat at risk of other issues that would further aggravate their hairball situation. The preservatives can lead to poor skin health which would cause over shedding. Overall, if your cat is already used to chemical preservatives in dry food, then Blue Buffalo is a safe option. The indoor cat hairball control recipe uses chicken, and pea protein but also has pea fiber and other natural fiber from superfoods to boost digestion. The inclusion of Omega 3 and 6 fatty acids from fish meal and flaxseed will boost your cat’s skin health and ensure that they’re shedding at a healthy rate. There’s also the benefit for the LifeSource Bits that contain a huge range of vitamins and minerals to keep your cat active. Usually, cats with hairball issues are low-energy. But, when you keep your cat active, their hair can naturally shed into the environment which should control how much hair they are ingesting during grooming. Purina stands out from most of the other pet food brands available in grocery stores. They’ve always focused on nutrition and using quality ingredients which weren’t a big deal until a few years ago. When everyone realized that brands like Ol’ Roy and Kitty Kibble were using harmful chemicals in their formulas, Purina proudly announced that they’d never been involved with these types of practices. Although there are some minerals and vitamin supplements in this formula, you’ll notice the lack of artificial flavors or preservatives. Using chicken, and fish meal you get a high protein percentage with tons of Omega 3 and 6 fatty acids. The downside is that although Purina provides top quality ingredients for most of their recipes, they’ve slid a little here. The use of corn gluten meal and poultry by-product isn’t reasonable in most recipes. 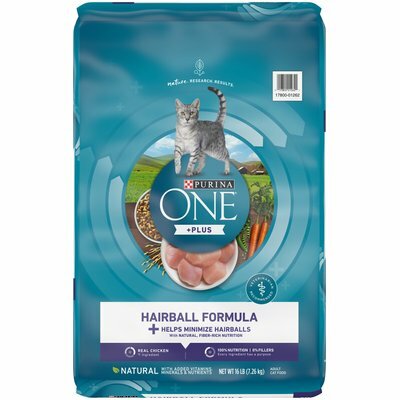 But, Purina stands by their recipe noting that these ingredients help keep the fiber and protein levels high while addressing hairball issues. If you know your kitty doesn’t have any allergies, this is a great option. But the grains in this recipe could further irritate skin and coat problems that result in hairballs if your cat does have allergies. The use of soy and fish meal do help reinforce skin health in cats that don’t show any signs of current skin issues. Overall, this is a great option for some indoor cats, but not for others. Purina is an affordable and reliable choice among pet owners. Nutro is becoming the game-changing name in pet food. This cat food formula focuses on using farm-raised chicken and vegetable proteins to sustain a healthy protein build, while also using natural fiber to help the body break down hair in the stomach rather than resulting in a hairball. Nutro goes above and beyond when it comes to nutrients. Alongside their high-quality ingredients, and no-GMO standards they use vitamins and antioxidants to keep up your cat’s overall health. They focus on skin and coat health first because hairballs are the present issue, but they include taurine to promote eye health and fiber for easy digestion. There’s not too much to dislike about Nutro’s build. The only thing that might deter some pet owners is that it is a dry kibble rather than wet cat food. Some cat’s with sensitive stomachs need a wet food option, and that’s the only time that this cat food wouldn’t be one of our first choices. Overall, the Nutro Wholesome Essentials Hairball Control Recipe delivers high-quality nutrients with outstanding ingredients. They update their recipes when they see room for improvement and focus on resolving the underlying issue for hairballs with increased fiber and promoting proper skin health. Iams has targeted the one subset of cat’s with hairballs that the other recipes here overlooked. This recipe is made for outdoor and indoor cats that suffer from hairballs. With beet pulp and FOS, your cat’s gut health is Iams’ top priority. We love that the recipe offers a complete diet with no gaps in nutrition. The salmon, chicken, and beet all help to provide a high protein and fiber content. There’s also the use of dried egg! The downside to this option lies in the ingredient’s list. Although the bag itself claims there are no fillers, the ingredients list exposes corn in 3 different forms. Corn grits, ground corn, and cornmeal offer little nutritional value and can irritate cat allergies. 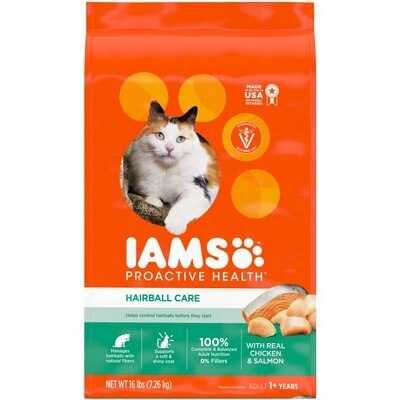 If you know your cat doesn’t have any allergies, then Iams is an excellent choice. The use of beet and salmon in place of other fiber-rich starches such as potatoes was a great move! But, the issue with the high volume of corn in this recipe is cause for concern because that means that most of the nutrients come from the supplements. 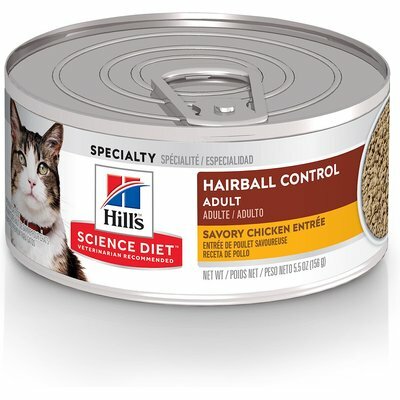 Hill’s Science Diet is well-known as a veterinarian favorite and with this wet cat food option for cat’s suffering from hairballs. They use a milder protein of chicken, turkey giblets and pork by-product but focus on oils that that will help your cat recover their skin and coat health from any over shedding problems. We love that there’s a varied protein build between chicken turkey and pork. The different proteins can make digestion easier as the different proteins break down in the stomach at different rates. There’s also the high amount of fiber naturally occurring in this recipe that will help break down hair in the stomach. The biggest disappointment in this formula is that there’s pork by-product. As mentioned above in our value section, by-products are over processed and might even encourage over shedding. Overall, if your cat regularly eats wet food, then Hill’s Science Diet is the top choice for you. Your cat could easily benefit from the high fiber content as it makes it easier for them to process hair they eat during grooming. The different proteins, soybean oil, and supplements of Vitamin E will help skin and coat health over time. But, if your cat seems to be doing fine with their skin and coat, you might want to try a different formula to avoid the pork by-product in this recipe. 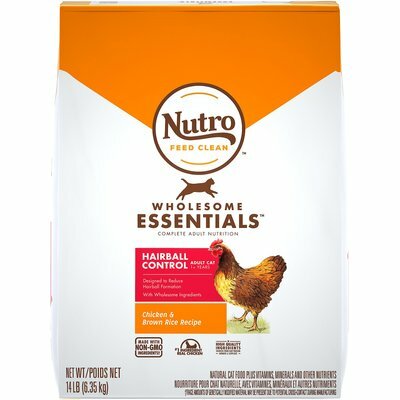 Nutro wholesome Essentials Hairball Control Adult Farm-Raised Chicken and Brown Rice Recipe is our choice. The Nutro ingredients list contains farm-raised chicken, fiber-rich pea protein, oat fiber, and soybean oil. These ingredients work together to deliver a lot of fiber, and a range of nutrients that cater to skin and coat health. Nutro commits themselves to improve their recipes to include higher quality ingredients. We see that this commitment reflects Nutro’s focus on providing nutrient dense and high-quality cat food! When you’re looking for cat food for hairballs you should give Nutro a try. They avoid artificial flavors and preservatives while using supplements to fill in any nutritional gaps!